The Martian Chronicles – Chapter Six - The Third Expedition (April 2000/2031) - Jimmie Aaron Kepler, Ed.D. The Third Expedition was first published as “Mars is Heaven!” in Planet Stories, Fall 1948. The arrival and demise of the third group of Americans to land on Mars is described by this story. This time the Martians are prepared for the Earthlings. When the crew arrives, they see a typical town of the 1920s filled with the long-lost loved ones of the astronauts. Captain John Black tells his crew to stay in the rocket. The crew are so happy to see their dead family members that they ignore their captain’s orders and join their supposed family members. The Martians use the memories of the astronauts to lure them into their “old” houses where they are killed in the middle of the night by the Martians themselves. The next morning, sixteen coffins exit sixteen houses and are buried. The original short story was set in the 1960s and dealt with characters nostalgic for their childhoods in the Midwestern United States in the 1920s. 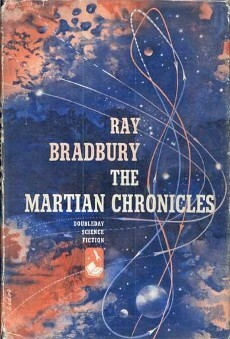 In the Chronicles version, which takes place forty years later but which still relies upon 1920s nostalgia, the story contains a brief paragraph about medical treatments that slow the aging process, so that the characters can be traveling to Mars in the 2000s but still remember the 1920s.